Face lift neck lift plastic surgery in Los Angeles by Aaron Stone MD for a more youthful looking you. A face-lift, neck lift or rhytidectomy plastic surgery is an operation that elevates and redrapes the facial skin and muscles to eliminate laxity and sagging via incisions around the ears. Time and gravity take their toll. Tissues lose their youthful tone and sag. A face-lift can’t stop this aging process. What it can do is “set back the clock,” improving the most visible signs of aging by removing excess fat, tightening underlying muscles, and redraping the skin of your face and neck, thereby removing jowls and tightening a flabby neck or turkey neck. A facelift – necklift can be done alone, or in conjunction with other procedures such as a forehead lift, eyelid surgery, or nose reshaping. The procedure does not address fine aging lines on the lips or cheeks which are more effectively treated with botox, chemical peel, dermabrasion or laser resurfacing. It does however diminish nasolabial folds or laugh lines as can be seen in my patients’ photos. 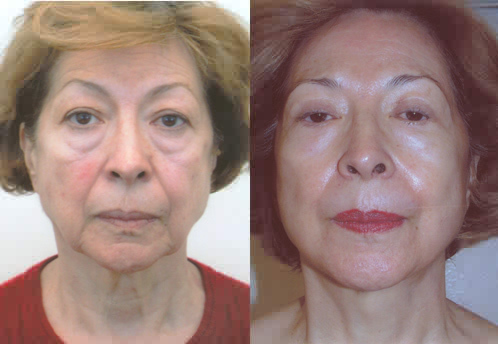 60 year old before and after face and neck lift, browlift and upper and lower eyelid blepharoplasties. Notice how the incision scar is hidden in front of the ear and under the earlobe. 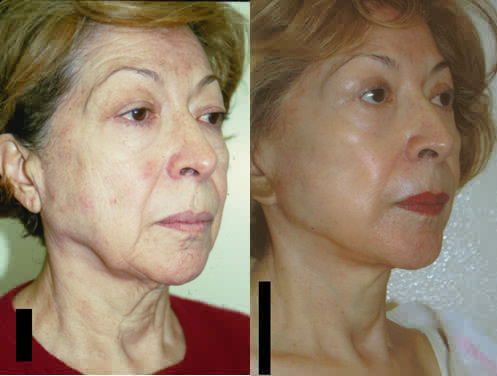 A facelift or rhytidectomy does diminish nasolabial folds or laugh lines as can be seen in this patient’s photos. This patient also had marked loss of facial fat especially in the temple, lower eyelid-cheek margin and cheek areas. By taking liposuction fat from the abdominal area and performing fat grafting or fat transfer to the deficit areas of the face the overall result of the facelift is greatly enhanced. She looks naturally younger without an overdone look. Notice how the incision scar is hidden in front of the ear and the attempt to maintain the original appearance of the earlobes. 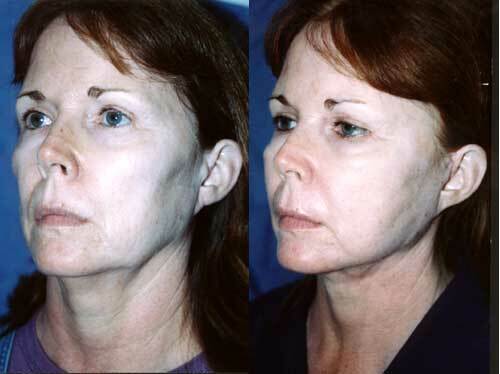 Facelift Necklift plastic surgery can enhance your appearance and your self confidence. Realistic expectations are important to be happy with any surgery. As each patient is an individual, different results can be expected in each patient. 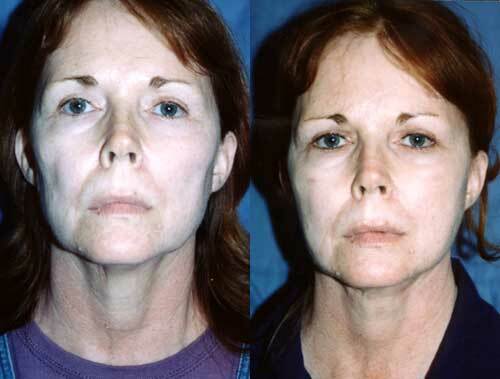 In severe cases of facial aging with deep nasolabial folds and marionette lines and large platysmal bands in the front of the neck there is no alternative to classical facelift surgery. For milder cases that are more options everyday. Currently the most popular alternatives are radiofrequency treatments like Thermi and Inmode. These require multiple treatments over a number of weeks without any downtime and can be combined with fat grafting or dermal filler injections. Although they can improve things they are not equivalent or a substitute for surgery. As with any type of surgery there is the risk of infection or bleeding. Additionally facelift necklift surgery can result in visible scars around the ears or on the neck, skin loss especially in front of the ears, several weeks of bruising, fluid or blood collecting under the skin, temporary or permanent numbness and or weakness of facial muscles. Use of the omega shaped incision around the ears extends surgery time and requires greater surgical skill but the reward of a much better quality or invisible scar are well worth it. These risks are minimized by choosing your surgeon wisely and following postoperative instructions. Just bending over to pick something up off the floor a few days after surgery can cause a blood collection under the skin. Just being in a room with someone smoking can lead to skin loss. The benefits are a younger looking you. Some patients look 10 or 20 years younger after surgery. The head is kept elevated, no lying flat or head down position, for 1 week. You should not even bend over to tie shoe laces. You cannot do vigorous or strenuous physical activity for 2 weeks, even jogging at 1 week can cause a problem. You should not keep your neck in an overly flexed or extended position for 3 weeks. Most of the bruising & swelling resolves in 2 to 3 weeks. Normal activities & work may be resumed within 2 to 3 weeks. Immediately after surgery your face and neck will be wrapped. The first night is spent in an aftercare facility so nurses can check for collections under the cheek or neck skin and keep your head elevated. Dressings and drains are removed within the first few days after surgery. Sutures on the face and neck are removed in 5 days. Make up can be worn 5 days after the operation but not over the incisions. You can go to the hairdresser in 6 days for shampoo, 12 days for color. You can wash your hair yourself beginning on the third day after surgery as long as you do not overly flex or extend your neck. Please bring a scarf with you on the day of surgery to wear after the bandages are removed the following day. This will cover your hair and any bruised areas. If you avoid smoking and excessive sun exposure and maintain a healthy lifestyle the effects of your surgery can last 10 years or more.